Ever headed toward a cat, had her take one look at you, then watched her hurl herself running in the opposite direction? You’re really not alone. 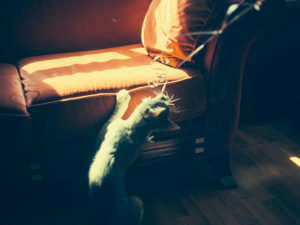 Now, if it’s your cat in question, and she only does this sometimes – especially if she is touching, tapping, or even whacking you with her paw right before scurrying off, you’re probably experiencing a harmless “catch me if you can” dare: a bait to try to get you to play. In cases like these, pick up an exercise toy and get to work – your feline overlord has some business she needs you to take care of. The situation’s a little different if your cat or kitten keeps running away from you – consistently. If every time you head toward her, she flees. Cats are fickle creatures, and while there’s no doubt we humans love ’em to bits, it can feel more than a little hurtful when our very own resident furries give us the cold shoulder. Why Does My Cat Run Away From Me? 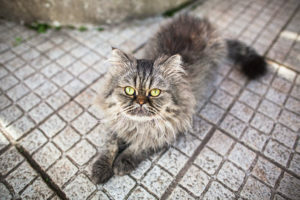 You might not like the answer, but I’m sure you already understand on some level why your cat flees every time you come near or even enter a room: your cat is likely running away from you because it’s not a fan of being pet, picked up, or whatever else it thinks you might “do to it” once you actually get close. When you make a move toward a cat, it’s 100% going to dart away if it thinks whatever’s coming out of you next is something it’s not going to enjoy. But I want to pet my cat. Can I get my cat to like being pet more? Yes, you absolutely can teach your cat to like being pet more. It’s all about a slow, steady process, but it’s actually very easy to turn your cat into a more cuddly version of herself. How? Take a peek at some of the tips I’ve posted here. Do I think it’s possible to help every cat transform into a snuggle-loving lap cat? No. But I do think you can make considerable headway and train every cat to be happier than she currently is with cuddles, petting, and general affection than before you trained her. How Can I Train My Cat to Stop Running Away From Me? Training your cat to be okay with you coming near. Get your cat to initially trust you to be next to him or her by repeatedly being near your cat without interacting with your cat at all. Training your cat to be content to interact with you after you come near. Get your cat used to the idea that you coming near to interact is not always a bad thing by cycling through different types of interactions each time you come near – many of which will be overwhelmingly positive and rewarding for your cat. Obviously, I’ll get more into depth and share the play-by-play of the process you should use below, so keep reading if this is something you feel you want to do. Step 1: Training your cat to be okay with you coming near. The first hurdle you have to overcome with a cat who always runs away can be a pretty big problem, as it’s a bit of a catch 22. You can’t prove you’re not going to be annoying when you get up close and personal if you can’t even get near enough to your cat to prove that to him or her because each time you try, he or she runs away. The solution? Work around your cat, approach when he or she is busy with something else – like sleeping or eating. Put down your kitty’s grub for dinner. While he or she is distracted, literally stand or sit next to him or her. Remember, don’t touch or even reach out to your cat at all. Just stay put, hands hidden behind your back, held together in front of you, or if you’re sitting, in your lap. If you have an especially flighty cat and you sit or stand right next to the food bowl, your cat is likely to not want to go near dinner at first, but the allure of food when a belly’s rumbling, and the fact that you’ve stayed put without moving or making an attempt to come too near for a while will convince kitty it’s okay to come over and eat. Repeat this process whenever you feed your cat, and if you’re interested in giving a few snacks throughout the day (make sure to use this trick to prevent overfeeding!) 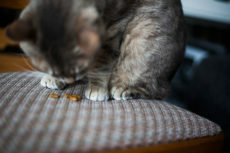 do the same – put the snack down, sit near your cat, stick around until he or she’s eaten and left, and in the meantime do not move or touch your cat. You can do the same with naps. Kitty dozed off in the corner? Go near your cat and sit or stand by him or her. Your cat is likely to wake up and take a look at you, but if you’re still and do nothing, is likely to return to sleep in no time. Stay close for a minute or two then leave. 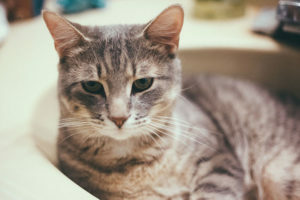 Do these things over and over and your cat will become perfectly content to let you come close because he or she will assume you’re simply going to stand or sit nearby and not try to interact when you do. You can tell that you’ve started to gain trust with your cat when there’s no longer any hesitation waltzing over to the food bowl even with you standing right there. Once you do have this base level of trust, start slowly walking near your cat when he or she is not distracted. 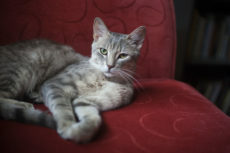 Like when he or she is sitting around doing nothing, hanging out in a cat tree, or whatever else your cat may be doing. Walk up to your cat, stand there for a few minutes, then just leave. Do this more and more often and your cat will stop running away from you when you walk up to him or her. Step 2: Training your cat to be content to interact with you after you come near. You coming near doesn’t always mean something it thinks is annoying is going to happen. You coming near sometimes means something really nice will happen. Go near your cat and simply sit near (not right next to) him or her. 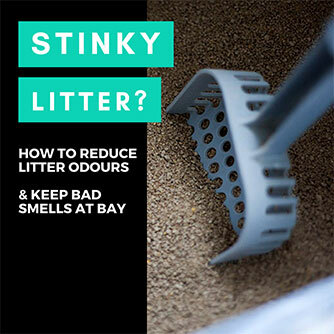 Walk up to your cat and “offer” your cat your hand to sniff. Walk up to your cat, pull out a treat from your pocket, and place it right in front of him or her. 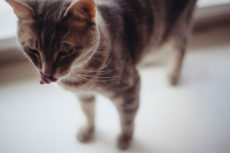 Go up to your cat while he or she is eating and stroke him or her gently. Go near your cat and sit right next to him or her without moving or making any attempt to interact. Walk up to your cat, pull out a treat from your pocket, and encourage him or her to eat the treat from your hand. Go near your cat and give him or her a very short, sweet, painless little pet on the back. Walk up to your cat and offer some catnip that you’ve brought with you from your hand. I’d come up with a few more, but at this point I’m sure you get the idea. 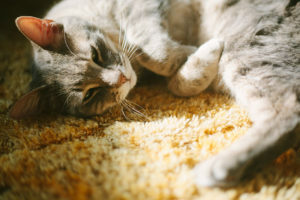 Make sure to intersperse really happy and rewarding things for your cat (let’s be honest, those pretty much all have to do with eating snacks) with a bunch of “neutral” things like walking up to your cat and not interacting, as well as some potentially “mildly annoying” things like being pet or touched. Eventually, your cat will learn to let you come near on the off chance that something really good will happen, and because most of the time, nothing too annoying happens. Spend as much time as you can mixing things up, and if you want your cat to be fine with being pet for a little longer, pet for a little longer each time you approach and it happens to be petting time. Once your cat stops running away from you, you can slowly teach your cat to be a lot more snuggly, and to be content enough to be pet. I’ve written out a full article on how to do this here, so if that’s something you’re interested in doing, you can check that out. You can also teach your cat to be okay with being picked up, which might be especially helpful in case for any reason you need to move your cat from one room to the next, or anything along those lines. I haven’t got an article on this topic yet, but I’ll be working on one soon and will link to it from this article once it’s done. Have You Ever Tried Encouraging a Cat to Stop Running Away? Have you ever met a flighty cat who runs away from pretty near well all people? What about a cat that ran away from house guests or specific family members? Did this behaviour ever change in the cat’s life? If so: how did the change happen? Did you try to build up trust through training a cat it was going to be okay whenever you came near, or did you just leave the cat for long enough for it to trust you? If it was the latter – how long did it take for the cat’s behaviour to change? Would hear your experiences in the comments! I have a gorgeous new baby, Basil, who is 6 months old. I’ve had him for about 5 weeks now. I also have 2 other cats, one that’s almost 2 years old and another that’s 9 months old. Basil LOVES the 9 month old – they are besties. When Basil first came home, he hid underneath the bed for 2 days. Then he slowly came around to eat. He wouldn’t let me near him for about 10 days. He ran away everytime I had to walk past him. Slowly, but surely, he has stopped running away if I have to walk past him now. We play with feather toys every day. Now he lets me pet him and rub under his chin and ears when he’s curled up in the cat tree. I consider that a huge leap, since he purrs almost immediately at those little sessions. Over the last couple of days I’ve woken up to him curled up on my bed, along with the 2 year old cat. That’s another huge step. But I still cannot reach down for him to pick him up. If I try to pick him up from the cat tree, he freezes and wants no part of it. He really does not want to be held. I think he’s trying to teach me patience, actually. I guess when I think of how far we’ve come in only 5 weeks, I am causiously optomistic that someday he might be a cuddle-bug. I’ll let you know if he ever is! I absolutely think he will become a cuddle bug considering how fast he’s progressed! Cannot wait to hear how he gets on! So lovely to hear he’s become besties with the 9 month old as well. I think cats learn a great deal from watching how other cats in the home interact with humans. He may be convinced more quickly, through watching you pick up and positively interact with the 9 month old, that he can trust you to pick him up, too. We just adopted a 6month old boy cat. The first night he was super clingy actually and didn’t want to be put down. He’s still good about coming to sit on a lap on his own and eats and uses litter as normal. However, whenever I walk around the house to do anything at all, even super tiptoe or regular slow walking, he scampers away as fast as possible and goes into hiding like I’m the abominable snowman. Why is he so afraid of me when I’m up and about and what can I do to quell that so he’s less anxious and wants to be around us even when we aren’t necessarily lying down. I think he’s possible he just needs some time to adjust to your movements. Maybe he thinks that you’re about to pick him up every time you walk around and doesn’t like the sensation of being lifted? I know many cats who hate to be picked up even though they love to be petted and even love to sit on laps. I would try feeding him, playing with him, giving snacks while you’re standing up and about, petting him, basically doing things he loves while you’re standing around or walking, so he gets that it’s nothing to fear and good things can totally happen while humans are not just lying down. And maybe try not picking him up at all while standing to see if that changes his behaviour. But overall, I wouldn’t be surprised if he got used to this being a normal thing that happens on his own with a little time. 2 weeks ago, I had bought a new kitten ragdoll, 6 months old, female unspayed. She is a super flighty cat, first few days, we can never be near her. When we approached her, she will run away and retreat to hiding. If we insist to approach her while she hides, she will hiss at us. We had tried Jackson Galaxy’s method of slowly blocked out her hiding spots, and it works as it sorta “forced” her to explore the rest of house. She now found her new hiding spot which is underneath the piano (I am planning to block it today). When in hiding, she will hiss occasionally while we walk past the piano. We had tried the “ignoring method”, we will purposely placed the food/treats near us, and while kitty eats, we did not make any eye contact or pet her. Once she finish eating she will either retreating to hiding and groom herself or start playing by herself. Any attempt to near her seems impossible as she will hiss at us and only way is to back off. She eat , drink and poop normal, which what I deduced the problem lies with the cat behaviour. We are currently trying out Feliway diffuser and spray and hope this can make her feel secure and calm in our house. Being the first time pawparent, we really want to give her as much love we can give. It have been 2 weeks, that we can’t even go near our kitty (she will hiss and we do not want to cause any unnecessary stress or fear in her), to hug her and pet her, her fur is getting rugged each day, it really pains me. I heard from other pawparents, that they need to forced interaction with the cat, scuffed the neck when the cat is dominance, forced carried the cat onto your lap. I feel is a bit too harsh on the kitty, any suggestion please? Last night, I put her dinner grub besides me while I sat on floor watching tv. No doubt she is sucker for food, she came out from hiding and went straight to her dinner. I had tried to pet her by using my hand, very slowly, try touching her fur at her side. She avoided my hand and continue to munch her food. I tried to bond with her through playtime but she seems like not engaging well (she was chasing the mouse for 4 seconds and after that she just sat there in a daze). I had tried using different toys, ribbons, toilet roll, she doesnt engage well either. After the “forced” playtime, i reward her with treats, same method i put the treats near me, tried to pet her for 3 attempts. She successfully ninja-avoided my hand. Not giving up, I am going to try to pet her while she is eating. However, the next day, she starts her habit of hissing at us whenever we walk past her hidding spots. For 2 weeks, my kitten is still hissing at us and doesn’t allow us to pet her, is this normal? Could she be sick? I desperately need help here. 2. Make sure you are not wearing perfume or any strongly scented lotions, shampoos, deodorants, soaps, etc. Sometimes cats really can detest the smell of a person and that might be enough to trigger hissing and fear or revulsion. I know my cat absolutely detests citrus smells, for example. Haven’t tried wearing a hand lotion that’s citrus smelling but I’m sure he would not be a fan. 3. Do continue to try petting her while she eats. Also try to feed her out of your hand to see if she will go for it. The more connected your scent gets with food in her head, the more she should trust you. 4. 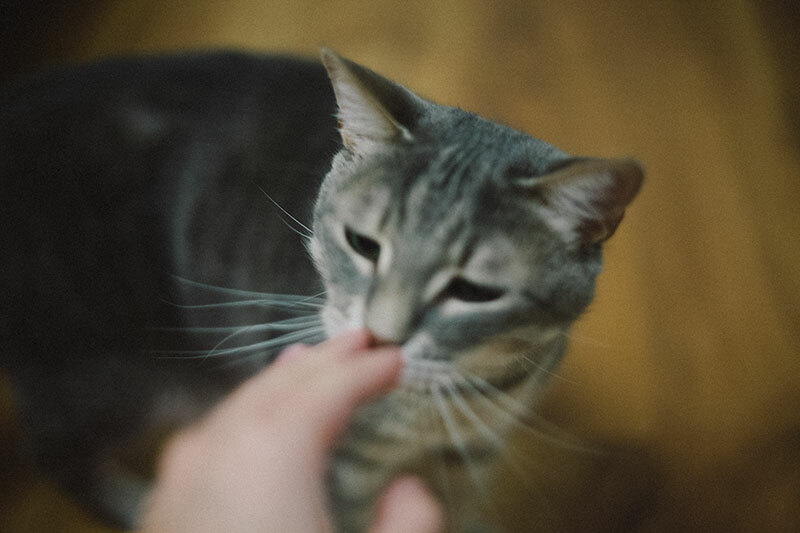 If she wont eat out of your hand with just any old food, try doing it with a treat she really likes or a teensy bit of fresh tuna (I don’t know a single cat who can resist that!). 5. Try to interact with her frequently, maybe once every half hour, so she gets used to you not leaving her alone and realizes you’re not going to give up on her getting used to you. If you find ways she’s okay with being interacted with – like if you talk to her, sing to her, offer her catnip on the palm of your hand – whatever it is, do more of it more frequently. 6. Some cats don’t like playing very much or are very picky about their toys. Do your best to invest in a number of different self play cat toys so in case she wants to interact with toys without you, she can get out her aggressive energy on the toy and hopefully be more relaxed when you try to interact with her later. 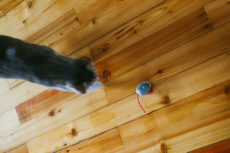 My incredibly lazy cat somehow still likes his electronic squeaking mouse toy, and will also play with cat springs by himself, though not much else strikes his fancy – so you may want to give those a try. 7. Make sure she can get her scratch on with lots of scratch-able things in the vicinity, it relaxes cats. If you don’t see her scratching on her scratch post, try a different style one. My cat hates the upright ones that are so common, try to find a slanted one instead. 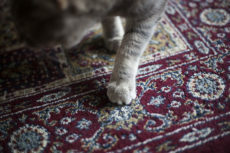 Kneading also makes cats more relaxed, so maybe a wool blanket or something else she can knead her claws into placed in her favourite sleep spot may help her to relax a little. 8. Things may get to a point where you finally do have to bite the bullet, grab her, keep her in your lap for around 5 or 10 minutes, and then let her free. She may not like it at first, but a few repetitions of this may get her to a point where she realizes you’re *not* actually threatening, scary, and going to do a slew of things she really doesn’t like. I’d recommend doing this kind of thing with a huge blanket in your lap, as at that point she’s just being placed on a blanket that happens to be on your lap rather than being directly in contact with you. Really hoping some of these tips help. Do stop by again and let me know how things are going! Thank you so much for the valuable advice! My husband and I decided to engage our local cat behaviourist. 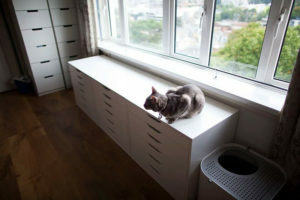 She gave us a lot of “homework” such as placing her hiding boxes higher, change of cat toys to find her favourite one. We actually grounded our kitty inside a small room. We had spent a good amount of time with her in a room everyday. We saw positive changes, lesser hissing, longer playtime, she came even closer to us when we clean up her litter box or give her food. I tried everything on the list with OCD attention to detail (with the exception to feeding tips; because our cats have gravity feeders; else our older cats rip each other apart — if made to eat at scheduled times). And my kitten (1 of 5 cats in our house) still wants nothing to do with me. She will sleep and cuddle with my wife all the live long day. But she will run away the moment she sees me. Her sister (from the same litter) loves me … and everyone else (but loves my wife the wife; however, I make a good substitute when my wife is indisposed); I can pick her up, pet her, snuggle her, and toss her on my shoulder (of course she likes interacting with everyone; and lets everyone do that with her). But her sister (the one who basically wants nothing to do with me), well … she hasn’t come around to liking me … and absolutely no amount of slow coaxing, or play time, or averted attention has worked to improve that. And I’ve come to realize I simply have to live with the fact that — the kitten my wife picked out for me — will never like me (she probably loves me?) … but at best, I get to enjoy her company and route for her happiness … from afar. I wouldn’t give up hope completely. My brother’s new cat used to want absolutely nothing to do with him, but now she’s very happy whenever he gives her snuggles and attention. Some cats just need more time to warm up to certain people, and I don’t know why but sometimes I do feel that certain cats have a gender preference initially? I would do my best to keep trying, but also to see if you can copy the way your wife pets and cuddles her. Sometimes there are certain ways specific cats really like and dislike being petted, and if you imitate another person’s actions that the cat likes being pet by, it can be a shortcut to getting them to like your cuddles better. Don’t give up, honestly! She may never like you better than your wife but I absolutely think she will come ’round, even if it takes her growing out of kittenhood into adulthood to get there. I’m not sure how long you want me to hang in there? It’s been 10 months. And she dislikes being around me more and more with each passing day. And she loves being around my wife more and more with each passing moment they spend together. My wife doesn’t cuddle her at all. In fact my wife, who is always busy reading, or on her phone, or trying to lay down to watch TV or sleep, is generally annoyed by our kitten’s consent attempts to snuggle her. Sometimes my wife pets her, but only for a minute or so. I’d pet her for an hour, if she’d bother coming anyway where near me. Often she’ll walk up on my wife’s chest and flop down. Then when I come over to snuggle my wife she’ll give me the stink-eye; and usually run away; especially if I reach out to pet her. 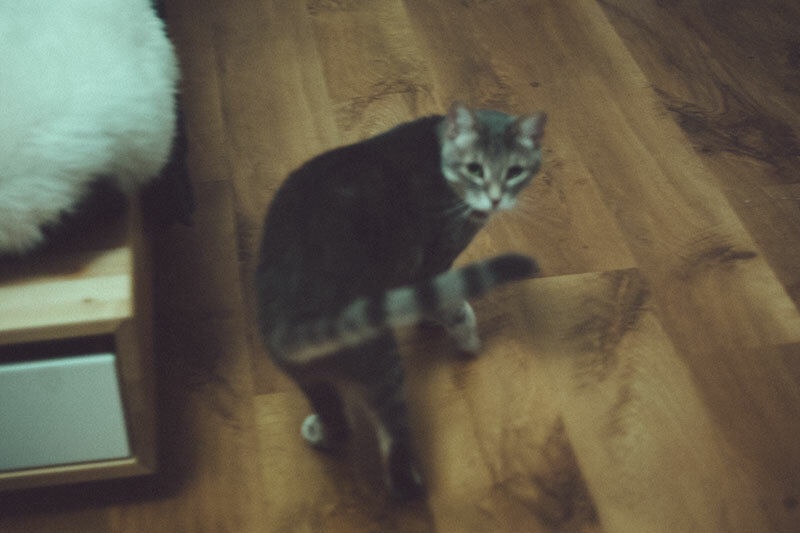 A friend says, ‘maybe another man who looks like me stepped on her tail when she was little (no, she has no tail injuries) and that’s why she looks at me and runs away.’ But that guess is as good as any. Again, I think it’s important to face the reality that sometimes an animal can look at a certain person and decide they don’t ever want to be near them. The adult hood thing is probably not going to pan out either. This is literally the second time this exact thing has happened. It happened with our white and black boy kittens, who are now old men. The black one — that my wife got for me — still hates my guts. Luckily our white one loves me an overly neurotic amount. I do have to agree that sometimes cats (like some people) just may never grow to like or appreciate someone no matter how good that person is to them. But wow does your story strike me as ever so strange.. It’s almost like your wife has the uncanny ability to pick out cats who dislike you, thinking they will…? Especially strange since all the other cats obsess or love hanging out with you so much more. I do hope this kitten grows into liking you, but sounds to me like she’s likely one of those cats who really only likes what she can’t have, and that’s your wife’s attention by the sound of it. Article really helped. Had some, maintaince guys come through my house when I wasnt home and they must of scared my Little one something fierce, she hissed at her sister, my wife and even Me whom helped with her birth. (Really terrifying first experience but the litter did fine) but did what you suggested and she’s in my lap right now purring like before. Oh my word, poor thing! I’m so glad the advice helped 🙂 Glad she’s back to normal! That’s a beautiful name for a long-haired white cat. I think something may have stressed her out – maybe a new perfume on you or honestly it could be anything in her environment, even things completely unrelated to you. That’s an excellent point, Dennis! 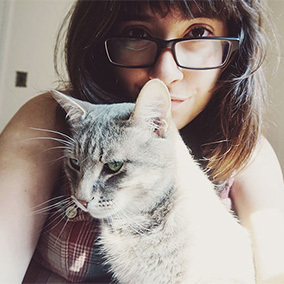 The Hipster kitties sound like my mum’s cat, who sometimes comes to snuggle and other times spends the whole day running away – totally depends on what kind of mood he’s in! We did almost exactly that with the newbies Simon and Seal, it works! Angel has always been a skitty kitty, but when her mood is right, she’s a lovey dovey!